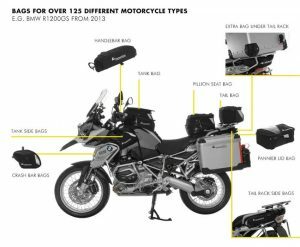 I personally couldn’t live without my motorcycle tank bag. It holds all of the little things I need frequently, and spares me the hassle of having to open my top box (or panniers on long rides) and sorting through all of the random things which inevitably end up there (yeah, I should clean it out more often). If you haven’t tried one yet though, consider these pros and cons. I’m obviously a big fan of tank bags and think that the pros outweigh the cons. However, it is really important that you pay attention to these cons because many problems can be avoided by choosing the right bag for your bike. The size is right for general, everyday use. Well designed and functional with numerous pockets and compartments. Very handy quick release system and handles allow for hassle free removal. There are some really massive tank bags out there, so they can be used for all types of gear. In general though,they are used for carrying small items that you need quick access to. 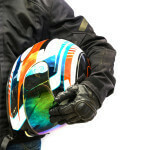 When I first started going on longer rides, I found this article about how to pack a motorcycle really helpful. 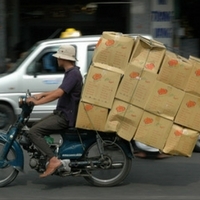 It covers all aspects of motorcycle luggage, including balancing load and safety considerations. I’m convinced that the riders who don’t like tank bags just have the wrong one. The wrong choice of bag could cause all sorts of problems – including some serious safety issues – so it is important that you take the choice seriously. There’s three main things you need to look at when choosing: attachment method, capacity, and material. The first thing to look at is the attachment method. 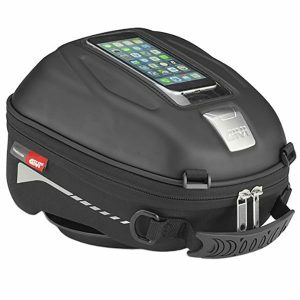 A tank bag might not even be compatible with your bike depending on how it mounts. These bags have 4-6 strong magnets. It is incredibly easy to mount and then remove it. You’ll find tons of options for magnetic tank bags. Just be warned that the cheap magnetic ones are likely to blow away when riding off-road or when loaded up with gear. Easiest and fastest attachment method. Magnets are heavy: When you are already carrying your tank bag with contents, jacket, and helmet, you don’t want the extra weight of magnets! Strap mounts are very secure without being pricey. The only thing that is annoying is when they don’t have a quick release. Then you have to take every valuable item out of the bag and put it into your pockets when making a pit stop. Not all have a quick-release option. This is hands-down the best way to mount a tank bag. You get a special fuel ring for your tank and then attach the bag to this. The issue with them is that they are only compatible with certain bags. Plus, they are pricier because you have to buy the bag plus the tank ring. If you are new to tank bags, I’d recommend starting with a more affordable option and seeing how you like it. Quick-release makes it very convenient. Only works with specific models of motorcycles and bags. Not all brands have anti-theft devices. In the video below, you can see how easy it is to mount using the fuel ring method. There are two camps when it comes to capacity. One is adamant that only small tank bags are worthwhile because large ones can get in the way. They think that you shouldn’t use a tank bag for anything but small essential items. The others will say that large is the way to go because of the extra storage space needs. These tend to be people who tour a lot or need the extra space for a pillion. One solution to this dilemma is to just get an expandable tank bag. Small enough to remain unobtrusive but with flex room in case you ever need to shove a 4 pack of beer inside. Whatever size you get, measure first to make sure it will not obstruct your handlebars. Safety first! They usually come in three types of materials: leather, canvas, or rigid materials. Leather: Great durability and natural waterproofness. Not so good when large leather bags soften and start to droop. Canvas/Nylon: Great because of its cheap price and because they usually have lots of pockets. Not so good against water. Rigid Materials: These are usually used with fuel ring adapters. They are great for staying in place, waterproofness, and against theft. Downsides are their higher price and because they usually aren’t expandable. Even the best bag isn’t going to be 100% waterproof. If not the material itself, but the zips which are likely to leak. So always put your vulnerable items in plastic bags or get your waterproof cover on ASAP when it starts to rain. As for rain covers, be warned that wind always seems to get under the rain cover. It will flap around annoyingly until it blows away or you take it off. These features are not essential but some nice extras never hurt. I’ve tried to include tank bags of various styles/functionality. One of these is sure to suit your riding style and needs. This Givi mounts on your fuel ring, so is incredibly secure but is easy to remove with quick-release. All parts are included but you’ll need to buy the mounting plate separately – and check which plate is compatible with your bike. My favourite feature is that part of it comes with a shoulder strap so you can easily take valuables with you during pit stops. 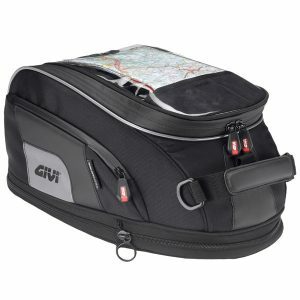 The Givi ST602 is listed as a semi-rigid tank bag. It actually performs more like a rigid. The difference is that it has a slight give when you push on it (hence why it is “semi” rigid). This helps prevent cracking. The 4 litre size seems to be just right to get in all of your essentials plus a few impulse buys. Like with the Givi tank lock rucksack above, you’ll need to buy the mounting plate separately. 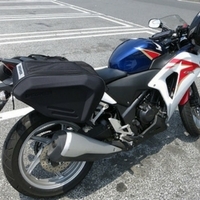 If you are looking for a cheap motorcycle tank bag, this is probably your best choice. Despite its low price, the Lions is well made out of a 600 denier synthetic. The material even holds up well in light showers (though you’ll still want to use the rain cover or keep vulnerable items in bags). The dimensions are 29x16x10cm. That would put it at approximately 4.5 litres, but I find it only really holds about 2.5 litres because of how it is shaped. Oxford is a very well-known and respected name for motorcycle luggage. What’s great about their M4R bag is that it can be used as a tank or a tail bag, which gives you some more flexibility on how to use it. As a tank bag, the design is really clever – like how it has a visor over the large map/GPS pocket and electrical outlets for use with your device. This model is 4 litres. My favourite of these best tank bags is the Givi ST602. The size is right for everyday use and it is designed really well so it doesn’t interfere with riding. For longer trips though, I’d use the Givi Xstream Expandable because of the expandable storage and how it converts into bum bag. The choice really depends on your style of riding though and how it fits your bike.